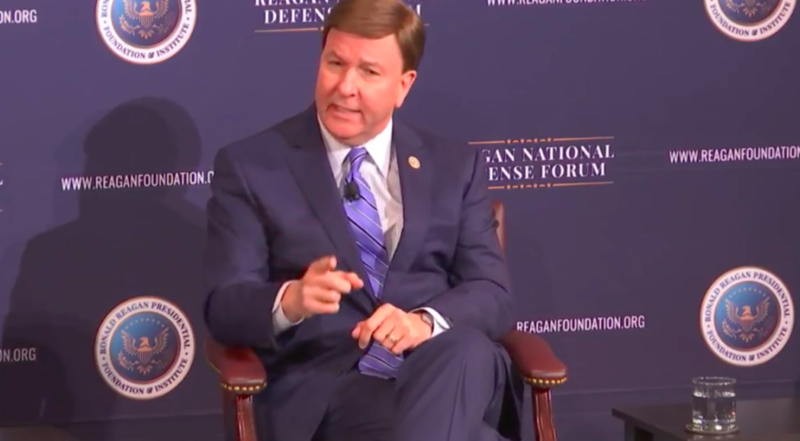 Rep. Mike Rogers (R-Ala.) speaking at the 2017 Reagan National Defense Forum. The space corps is the rare issue that lawmakers on the left and right agree on. It was not meant to happen in 2018. But it will happen, perhaps in a few years. That is Congressman Mike Rogers’ take on the space corps, a cause he has championed as chairman of the strategic forces subcommittee of the House Armed Service Committee. Rep. Rogers, of Alabama, and ranking subcommittee Democrat Rep. Jim Cooper, of Tennessee, inserted language into the House version of the National Defense Authorization Act for Fiscal Year 2018 directing the creation of a stand-alone space corps within the Department of the Air Force — similarly to how the Marine Corps was stood up within the Department of the Navy. The provision didn’t make the final bill but the committee’s crusade to give space an independent voice in the Pentagon continues. Rogers noted that it took 26 years for the Air Force to evolve out of the Army Air Corps. “We don’t have 26 years for this. But it’s going to happen. It’s inevitable,” he said Saturday at the Reagan National Defense Forum in Simi Valley, California. “What we did this year demonstrated a sense of urgency,” said Rogers. The space corps would exist inside the Air Force, which currently oversees 90 percent of U.S. military space programs. “What we have found is that space has not been able to get the attention it needs, culturally or resource wise,” he said during a panel discussion that also featured Air Force Secretary Heather Wilson and U.S. Strategic Command chief Gen. John Hyten. Rogers suggested that the Air Force leadership should have worked with him to shape the space corps instead of rejecting the idea and pushing back. And he brought up other grievances. Wilson did take issue with some of Rogers’ criticism. She agreed with Rogers and Hyten that “we need to move quickly,” but argued, as she has repeatedly, that a space corps is not the answer.